Tell me again who the terrorists are (as skies are sprayed above our heads). CANNONBALL, ND – Water Protectors who have traveled to the camps at Standing Rock have reported contracting a condition they refer to as the DAPL cough. Symptoms of the DAPL cough include coughing accompanied by severe fatigue, deep lung congestion and discomfort. Not cured by antibiotics, it often lasts from two to 16 weeks. Some report bloody noses and brain fog. Others report coughing up blood. Some say the cough is a simple response to the weather and the rough winter living conditions at camp or a possible reaction to repeated exposure to chemicals sprayed by the police at the front line. Others blame low-flying crop-dusting planes that might be dropping chemicals on the camps late at night. An EPA report dated April 22, 2016 states that 40,000 pounds of the chemical Chlorophacinone (one of its trade names being Rozol®), which is intended to be applied by hand in prairie dog burrows, was broadcast on the ground of the Meyer’s Ranch property which borders Standing Rock’s Oceti Sakowin camp and contains sacred burial grounds contested in September. The violations were first discovered in late April, shortly after protests at Standing Rock began, when six dead bald eagles and several dead bison were found on the ranch. The EPA ordered that Meyers till the deadly chemical under the soil, effectively removing the surface contamination, but not reducing the risk of groundwater contamination. Dead bison were also found as recently as August 2016, documents said. The EPA reports that prairie dogs were left where they died instead of being routinely removed to protect other wildlife. This makes the entry of Rozol® into the local food chain quite probable. Considering the danger, the EPA’s orders to bury the chemical without any kind of fine or penalty to the commercial farmer seem light in comparison. 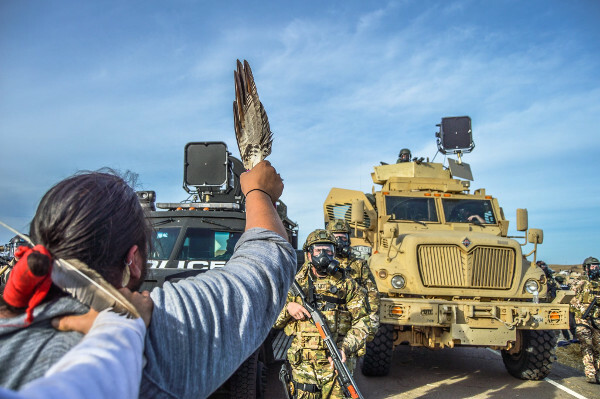 Since April 2016, more than 20,000 people and members of over 350 Native American nations have traveled to the Standing Rock Sioux Reservation to join in protests against the DAPL pipeline and to support Native American treaty rights and sovereignty. Protectors who have fallen ill after their return from the camps have discovered Rozol® and other chemicals in their blood stream and in hair samples and have reported this to the UN. Therefore, Protectors with symptoms are urged to report to a medical professional and be tested. They should request a full toxicology screening for Rozol®. Chemical exposure is very difficult to diagnose. People must be sure to tell the doctor they were likely exposed to airborne chemicals, with a possibility of ingestion of Rozol®. All suspected positive findings should be sent to Inherent Rights Agency and the Standing Rock Legal Collective. Sadly, like in Flint, MI, corporate interests are being prioritized over the people’s interests. The possible entrance of these chemicals into the food chain and water table are being ignored, and the rancher is not held responsible for the damage except in the form of cleanup. The health effects of this action must be documented and reported to save lives and to create a paper trail that can be used for accountability. Oh my gosh, am so sorry. I had no idea the illness is recurring! I haven’t heard of any discussion groups. they say third time is a charm, fortunate to not be coughing blood, but severe cough, fever and very very tired. Almost like clockwork, every 7 months, I left Standing Rock just after Thanks-taking ’16, lasted 6 weeks and that was only because I got an intravenous immune boost, the second time began May 24th, 7 weeks, again another immune boost from my naturopath. Now still with fever that began 2/16, will see how long. Would really like to know if there’s a discussion group somewhere for this.